This week was a very interesting one, I started the week off with some confined pool sessions for my new PADI Open Water student, Mike, the sessions went really well and he looked very enthusiastic. The next day was open water at Abades, the sea state could have been better but it was good enough to go in, so we set of in to the water. This week I also got to brush up on my French because I had 3 Belgium DSD’s ( Discover Scuba Diving) in the pool in the morning and then we went to do 2 fantastic dives at Abades. This week was also Ollie’s final week as a PADI Rescue diver. We did her skill circuit which went really well, and we also did the kit exchange, and then the deep assesment to top it off. I am so proud and happy for Ollie, she has become an amazing PADI Divemaster through out the weeks and we will all miss her. It has been a fantastic week, and I am now starting to realise how little time have left here in Tenerife. Posted in: PADI Divemaster Intern Blogs, PADI Divemaster Interns, PADI Instructor. 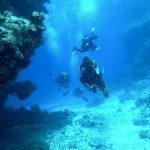 Tagged: Discover Scuba Diving, Discover Scuba DIving Tenerife, Divemaster, Diving Tenerife, DSD, PADI DIvemaster, PADI Divemaster internship Tenerife, PADI Open Water Tenerife.